New to the Bible? Wandering around confused? One of the roadblocks that can get in our way with the Bible is familiarity. This comes in two flavors. Some of us are so familiar with the Bible that we got jaded. We come to it with an “I’ve heard it all before” attitude. We talked about how to deal with that in the last post. But there are folks on the other end of the spectrum, people who simply aren’t familiar enough with the Bible. These folks might now know their Old Testament from their New. They don’t know if Moses came before John or the other way around. The Bible is a big book and a complex one. You’re not crazy if you feel a little intimidated. Is this your story? Maybe you became a Christian after hearing about Jesus and headed home with a shiny new Bible. You started reading Genesis, but after a few weeks just got bogged down. Or maybe you got excited to learn more about Jesus’ teaching and went online for Bible studies where you found yourself unexpectedly swamped in the theological debates you know nothing about. Maybe you keep hearing pastors or more experienced Christians talking about all this great stuff they find in the Bible, but when you read it, you just feel lost. It’s hard to stay motivated to read it when the whole project feels so unclear and confusing. The starting point (just like the last post) is to acknowledge the truth of where you are in your relationship with the Bible. If you didn’t grow up with the Bible or go to a Christian school, it’s likely you know a lot less about the Bible. That’s not a judgment or condemnation; it’s just a fact. Just because you can’t quote chapter and verse doesn’t mean you love Jesus less. The fact that you stumble over weird Old Testament names when you read the Bible out loud means nothing about your value as a person or your spiritual maturity. Your level of experience with the Bible is mostly an indication of your background. It says very little about your relationship with God. Even your disadantages have advantages. People like you who don’t have a lot of experience with the Bible have a certain set of disadvantages. You might be slow in looking up verses. You might not recognize every Bible character mentioned in church. You don’t have a lot of scripture verses memorized. You probably don’t have a clear picture of the time-line of the Bible or where different stories fit. With your limited experience, you might be intimidated to participate in discussions about the Bible or theology. You might have a hard time sorting out if pastors and Bible teachers know what they are talking about. These disadvantages are all a result of your lack of experience. The good news is that those things will change as you grow in familiarity. On the other hand, you have a unique set of advantages that people who grew up reading the Bible just don’t have. When you read a passage, your mind isn’t cluttered with various interpretations. Preconceptions aren’t getting in your way. You don’t have to de-program a whole bunch of teachings from your childhood. You probably come to the Bible with very little church baggage. You don’t have years of certain interpretations hanging over your head. You’re not pre-committed to some long-held theological perspective. That allows you to see the Bible in a much clearer light. When you read a story in the Bible, very likely you can connect with it in a much more visceral and emotional way. You’re hearing it as a story, rather than as a sermon or a tale with a moral. See, being unfamiliar with the Bible doesn’t make you a bad person or less spiritual. In fact, there are ways that the Bible is much more immediate and engaging for you. But, there’s no question, becoming more familiar with the Bible will help you considerably as you learn to follow Jesus. Just start building a relationship. Being unfamiliar with the Bible becomes a roadblock if it makes you feel insecure. When you can’t find your way around it’s easy to get intimidated, especially when you’re around those folks who can whip through the Bible or can remember every verse citation by memory. If lack of familiarity is your roadblock, what can you do to move past it? Set aside regular time, whether daily or weekly, to read the Bible. When you do, don’t read randomly. Read with an intentional plan. Read through the Gospels. Then read through the whole New Testament. If you only have 15 minutes a day you’ll read through the New Testament in about six weeks. In six months to a year you can have a working knowledge of the Bible. All you need to do is give it regular attention. 2. Get the Big Picture. The Bible isn’t a single book. It’s a collection of 66 books written over a long period by different people in different cultures. Get to know how the Bible is laid out, where things fall, and their context. 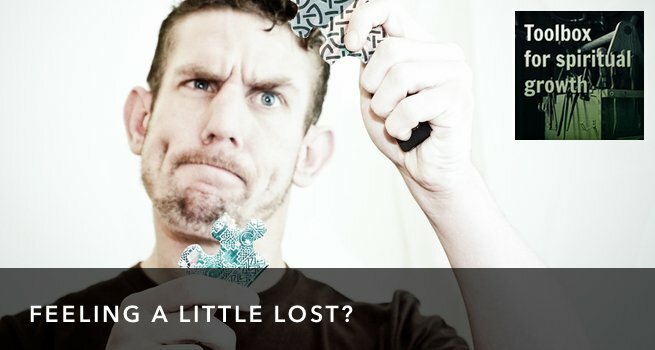 As you do, you’ll start feeling less lost. First (I know this will sound crazy) start by reading The Jesus Storybook Bible, by Sally Lloyd-Jones. I know, it sounds weird to read a children’s Bible, but this one is special. It’s beautifully written. Most importantly, it will give you a chronological overview of the Bible quickly. You’ll be introduced to some of the central themes, especially where Jesus fits in all of it. Getting this in mind will give you a mental map that will allow you to place passages and stories you read. The Bible isn’t like a novel, or even like an encyclopedia. It’s a little library. Learning about the different kinds of writing in this library will help you enormously. I recommend two books that are accessible and very helpful How to Read the Bible for All It’s Worth by Gordon Fee and Let the Reader Understand by Dan McCartney and Charles Clayton. Both of these books will give you a clear understanding of the nature of the Bible, how to read the different kinds of literature within the Bible, and an introduction to some of the culture and background of the Bible. How to Read the Bible for All It’s Worth particularly is good. It’s short, focused and practical. It will get you up and running in no time. 4. Don’t lose your freshness. The fact that you aren’t weighed down with baggage is a gift. As you gain familiarity, don’t lose this. Always keep an open and inquiring mind. Always stay connected to the story, rather than the “moral of the story.” The Bible is a tool that God uses to shape our hearts and minds. If you stay open to being shaped, the Bible will never lose its power for you. Getting familiar with the Bible is like anything else. Give it time and attention, and it will come. 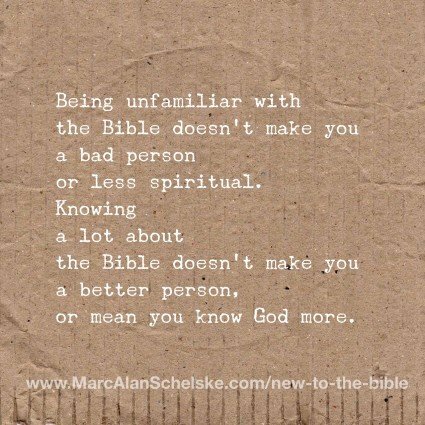 Knowing a lot about the Bible doesn’t make you a better person. Knowing a little doesn’t make you a worse one. But we’re not in this to be a better person. We’re in this because God has promised to speak to us. We want to have a vibrant relationship with God, one where God’s word becomes for us a living and active part of God’s voice in our lives. If you’re new to the Bible, just jump in and get familiar. Trust that God is working in this ancient document and that as you spend time with it, God will bring it to life in a powerful way for you. Journal about your current familiarity with the Bible. Why do you have the familiarity that you have? Where did it come from? What’s been helpful about that? What’s been hindering? What benefits do you see in coming to the Bible with little pre-conceived knowledge? This post is part of a series about ways we get in the way of our experience of scripture. The series is called Jumping the Hurdles. Maybe you need to ignore the rules in the Bible. Is the Bible human or divine? The problem is in your either/or question. 2 Reasons why using the Bible to prove your point is often wrong. Has familiarity with the Bible left you bored and jaded? Why reading the Bible straight through is usually a bad idea. When the Bible has been used to bash, clobber or hurt you. Disclosure of Material Connection: Some of the links in the post above are Affiliate Links. This means if you click on the link and purchase the item, I will receive an infinitesimal affiliate commission, which I solemnly swear to spend on important boks and trivial electronics. Regardless, I only recommend products, services, or books that I have personal experience with and that I believe will add value to my readers. More information here.